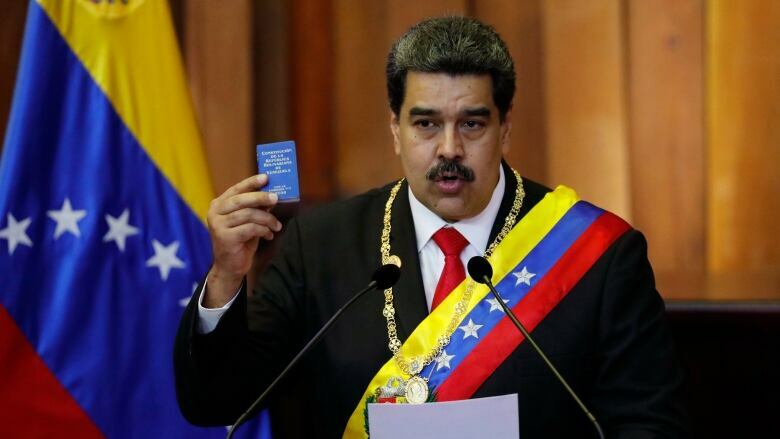 Venezuelan President Nicolas Maduro was sworn in Thursday for a second term amid international calls for him to step down and a devastating economic crisis. Venezuelan President Nicolas Maduro has been sworn in for a second term amid international calls for him to step down and a devastating economic crisis, but with some long-time friends in attendance both from abroad and at home. A dozen Latin American governments, U.S. and Canada have rejected the legitimacy of Maduro's next term, and Washington has sanctioned top officials in his government, and there were fresh condemnations on Thursday. 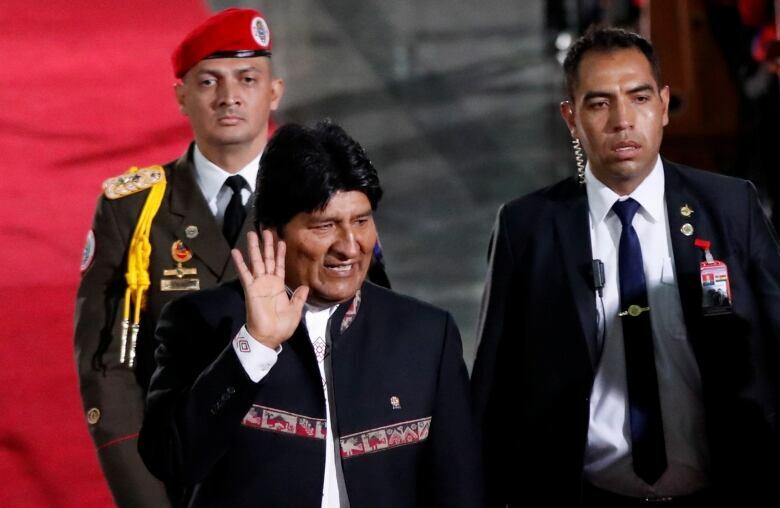 Some regional leaders did attend the ceremony at the country's Supreme Court in Caracas: Cuban President Miguel Diaz-Canel, Bolivian President Evo Morales, Nicaraguan President Daniel Ortega and El Salvadoran President Salvador Sanchez Ceren. "Venezuela is the centre of a world war led by the North American imperialists and its allies," said Maduro, the former bus driver. "They have tried to convert a normal inauguration into a world war." Maduro, 56, credited his allies, some who have also faced censure from the U.S.
"A new world has risen up that refuses to be controlled by the imperial and hegemonic orders of a single nation or its satellite countries," Maduro said following his swearing-in. "That's the rallying cry of our revolution to the peoples and governments of the world." As the ceremony was going on, the Organization of American States in Washington voted not to recognize the legitimacy of Maduro. The organization's council adopted a resolution presented by Colombia, Argentina, Brazil, Chile, Costa Rica, the United States, Paraguay and Peru. Venezuela's Ambassador Samuel Moncada called the measure adopted Thursday "a hostile act ... against the will of our nation." The vote was 19 in favour, eight abstentions and six against. In a statement, Foreign Minister Chrystia Freeland said Canada, one of the 19, "rejects the legitimacy of the new presidential term" and called on Maduro to resign. "The suffering of Venezuelans will only worsen should he continue to illegitimately cling to power," said Freeland. Meanwhile, President Mario Abdo of Paraguay said his country would cut diplomatic ties and withdraw its officials from Caracas. "There are no bad consequences when defending just causes," Abdo said in a television address. "The cause of liberty and democracy is a just cause." Maduro's second term will extend Venezuela's socialist revolution amid widespread complaints that he has stripped Venezuela of its last vestiges of democracy. Maduro denies that he's a dictator and often blames U.S. President Donald Trump of leading an economic war against Venezuela that's destroying the country. "Not before, not now, nor will there ever be a dictatorship in Venezuela," Maduro said in a Wednesday news conference. Oil-rich Venezuela was once among Latin America's wealthiest nations. It produced 3.5 million barrels of crude daily when Chavez took power. Output now has plummeted to less than a third of that. Critics blame years of rampant corruption and mismanagement of the state-run oil firm PDVSA. The economic collapse has left the nation of roughly 30 million in the throes of a historic crisis. An estimated 2.3 million Venezuelans have fled their nation's hyperinflation, food and medical shortages over the last two years, according to the United Nations. Those remaining live on a monthly minimum wage equal to less than $5 and falling daily. Venezuela's splintered opposition movement has failed to counter the socialist party's dominance. Maduro's government has jailed or driven into exile its most popular leaders. Anti-government politicians successfully rallied thousands to the streets across Venezuela for four months of demonstrations in 2017, when clashes with government forces left more than 120 protesters dead and thousands injured. Maduro remained squarely in power. In May, he declared victory in presidential election that his political opponents and many foreign nations consider illegitimate because popular opponents were banned from running and the largest anti-government parties boycotted the race. The opposition-led Congress opened its session for the year this week, led by 35-year-old Juan Guaido, who vowed to battle against Maduro. Guaido said Maduro is "usurping the presidency." In a statement released by the State Department on Thursday, U.S. Secretary of State Mike Pompeo urged those who support the regime "to stop enabling repression and corruption and to work with the National Assembly and its duly elected leader, Juan Guaido," characterizing the assembly "the only legitimate branch of government duly elected by the Venezuelan people." The Trump administration has increased pressure on Maduro through financial sanctions, this week singling out powerful Venezuelan media magnate Raul Gorrin. U.S. banks are also banned from doing business with Venezuela, putting a financial strangle-hold on the cash-strapped country. Canada has also imposed sanctions on some Venezuelan officials. "In direct response to the actions of the Maduro regime, Canada has imposed targeted sanctions against 70 regime officials and, in collaboration with five other countries in the Americas, referred the situation in Venezuela to the International Criminal Court," said Freeland in Thursday's statement. 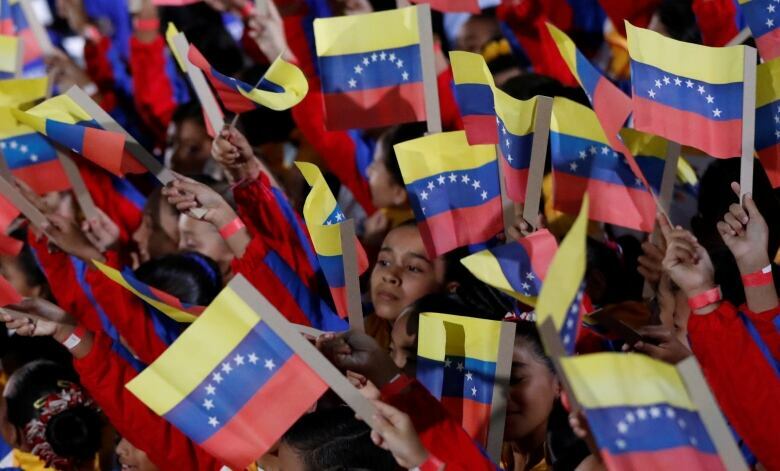 While Maduro's popularity has plunged amid scarcities, hyperinflation and rising authoritarianism that have sparked a mass emigration, supporters who receive government subsidies in shantytowns continue to back the man who took over for the late Hugo Chavez. "It's not the president's fault," said Frances Velazquez, a 43-year-old mother of two who survives on government-subsidized boxes of rice, flour and cooking oil. Velazquez blamed opportunists who drive up the prices on scarce items making life difficult for families like hers. Others, like construction worker Ramon Bermudez, have lost hope of escaping Maduro's rule and planned on hunkering down at home for the inauguration. "All that's left to do is raise your hand to heaven and ask God to help us," said Bermudez, camped out on a Caracas sidewalk with hundreds of others waiting for gas. "There's nothing more." Bermudez, 52, pointed out the irony of living in a nation with the world's most abundant oil reserves yet having to wait in line overnight recently to fill three canisters of natural gas to cook at home. One by one, hundreds came down from hillside neighbourhoods and took their place in line, waiting for a truck to deliver natural gas. Then they'd carry it home. Bermudez lives with his wife and two children but said many parents have bid farewell to their children rather than endure the crisis. "Sadly, I have many neighbours who have cried and have seen their children depart for other countries in search of a future," he said. "They're looking to improve their lives, having lost hope."